“Oh! Use that one!” says a Makaha Elementary fifth grader to Dawn Wong, community relations administrator at Hawaiian Electric. They are on the school tour of Plastic Fantastic?, now on view at Spalding House. Wong complies, and proceeds to weigh a fragment of weathered plastic on one of the kitchen scales in the exhibition. The scales and bits of plastic are part of the exhibition’s One Ounce Project, in which visitors are tasked with creating one-ounce sculptures out of plastic collected at O‘ahu beach cleanups. Under the pressure of four dozen eager eyes, each waiting for their turn at the activity, Wong finishes her sculpture and hangs it on the wall. Meanwhile, on the other side of the room, Wong’s colleagues Stacy Hsiung, Kurt Tsue, and Sharon Higa measure their own bits of plastic. The outreach team takes these field trips to see how Hawaiian Electric’s involvement impacts the community in a very real way. 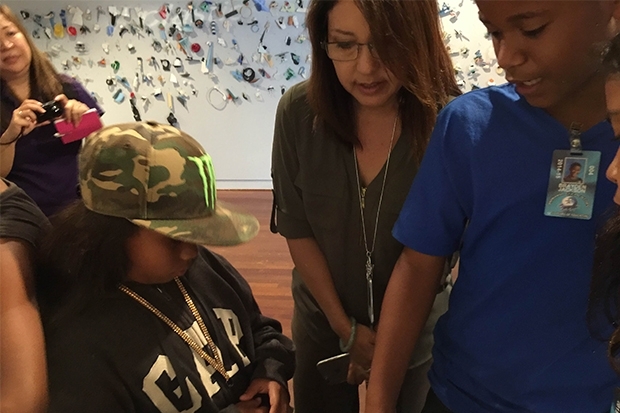 “The museum’s school tour program provides students with an enriching learning experience that can’t be found in the classroom, said community relations manager Lori Hoo. “It’s rewarding to know that for some kids this is the first time they’ve ever been to a place like Spalding House and we’re happy to make that possible.” As a bonus, the team gets to see and make art with the students. As the group made it’s way through the gallery, the team paid close attention to how kids reacted to the exhibition and the kinds of questions they asked. They also made time to take an impromptu group selfie (“usie?”) in front of Aurora Robson’s ethereal looking plastic sculptures, and participate with the students in creating a one-ounce plastic sculpture. Funding for ‘Plastic Fantastic?’ Is provided by Hawaiian Electric, supporting STEM education, the arts and the environment in Hawai’i.